This story is from 2010, when a group of kart-racing friends and I went on a European racing vacation. We watched British Touring Cars at Oulton Park, then traveled to Belgium for a track day at Spa on the fabled Formula One track. We then tried, but failed, to get into the Donington collection (long story) and raced karts indoors at a pretty fast London track. To finish, we spectated at our collective first LeMans 24 hour race. Below is the story of the track day at Spa. RSR, the company that ran the track day, has since vastly uprated their fleet of cars to new and highly impressive. A link is provided at the end. Try the catered lunch at Spa. Trust me. The sky was a threatening grey as we arrived at the very chilly Spa-Francorchamps Circuit. We were followed by a train of three GT3RS Porsches, one with the very “see-me!” Lime Green paint. The smile on my face was huge as we rolled into the F1 paddock, and into the F1 garages. After a quick check-in and a brief tour of the paddock, we ogled the countless Porsches (many 911s, a few GT3RSs, a Carrera GT and one GT2 being tuned for imminent production by a factory test driver). Also two Nissan GTRs, a Ferrari 550, some Astons, a few Alfas and one very racy Austin Healy 3000. RSR supplied our cars, a newish RenaultSport Clio 197 Cup car and an Alfa Romeo 75, one of the school’s original track day cars, the only two left-hand drive cars still available to us. RSR’s owner, Ron Simons, took us on a walk around the track, giving tips about lines and entry speeds, etc. Simons warned drivers of the ease at which you could get into trouble at this track. As I stood at the top of the hill at Les Combes, the chicane where Mika Hakkinen passed Michael Schumacher so memorably, the view back down the hill toward Eau Rouge was OMG steep. Pictures do not do it justice whatsoever. The track is built into the side of two mountains, going up and down the steep sides and running through the valley only on the way back to the pits. Of some minor concern during this walk around was seeing an iron manhole cover right on the outside white line, right in the middle of the very fast downhill Pouhon, two very fast turns taken as one arc, the natural tracking out of the car forcing the driver out to the line right where this manhole is. I would not want to see if it were grippy in the rain. The track is challenging and FAST, very FAST. Even the chicanes, with the exception of the replacement for the old “bus stop”, were FAST. Tracks like VIR and Mid-Ohio are more technical. About the time I had sailed through Eau Rouge (left) for the umpteenth time, I realized that years of high-speed roadrace karting made curb-hopping and flat-out speed somewhat second nature. While I had not driven a car of any sort at speed on a race track for a long time, I came to grips with both the racing line and the car pretty quickly. I had forgotten the sheer pleasure of going up and down through the gearbox at speed. By my second session, right after a superb track-supplied lunch, I was already looking for places to go faster. This is not to say there weren’t dramas: while testing the Alfa and track limits in my first session, I missed the new “Bus Stop” chicane a few times and a wild tank-slapper out of it. Going faster in my second session, the half-spin trying fifth in the decidedly fourth gear Pouhon was interesting! I would have loved to have seen the face of the Porsche 944 driver already out by the wall (having completed his own off) when he saw me coming towards him, backwards, tires smoking. But thanks to the huge asphalt runoff area through these two turns, I let off the brakes a bit, kicked in the clutch, got it stopped with engine running, and took off again. I previously hated the sight of yards of asphalt runoff. I now have a new appreciation for their ability to stop a spinning car without the requisite “crunch” sound. The track day at Spa was a wide-open affair. Anyone could go out at any time in any car. You had GT2 Porsches, Nissan GTRs, older 911s and the Alfa, Clio and Lotus Exige rental cars that RSR supplied, all at the same time. Drivers were allowed to pass anywhere on the track as long as the pass was safe. 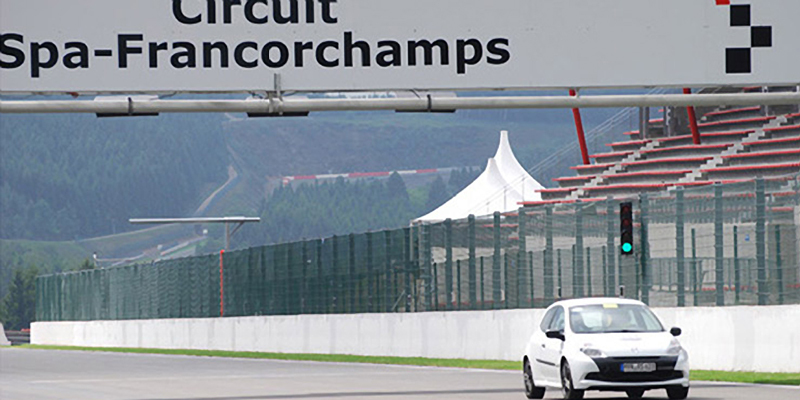 The racer in me came out when I got a great run out of Eau Rouge in the Alfa on one lap and pulled my buddy in the Clio up the Kemmel Straight. I tried for a pass under him into Les Combes, just like Hakkinen on Schumacher. I’m driving a rented car and I don’t think he sees me….. Another thrill was being able to pretty closely tail a GT3 Porsche for 2 laps, braking heavily and late into the corners, accelerating hard out of the corners. The probably novice GT3 driver was just able to keep me behind over the lap, legging it out on the straights to keep me behind. He finally stepped on the gas out of Stavelot 2, letting out many, many horsepower. He lost the Alfa, but then went immediately into the pits. So what’s it like to drive the track already? Into Malmedy, a flat-out right-hander. You then descend into the Rivage right hander, with a fearsome gravel trap right at the outside edge of this corner (at the time) just waiting to swallow you if you enter too hot. The corner seems to go on forever as it keeps on going downhill into a short straight followed by the still-steep downhill left of Turn 9. Steeply down the very fast straight and into fifth approaching the Pouhon lefthanders. This double-apex turn is taken as one smooth arc to set up for the fast Fagnes chicane. Briefly on the brakes into Fagnes. Power on through the right-left onto the short straight into Stavelot, the first of two fast righthanders on the way back to the pits. Through the straight between these turns, the air flowing into the Alfa would make it sound like a 747 was trying to land in the cockpit. Kinda weird, but I learned to expect it! Just inside here is the famous Spa kart track. Outside of the second right (Stavelot 2) is the Medical Center, right against the catch fence. It appeared that if you unfortunately got it just right (or wrong), you would land squarely in the Medical Center. Up the F1 pit straight, again very steep. As you just about get back up to speed, you’re heavily braking, downshifting and turning into the La Source Hairpin. I tried various lines through here. Hugging the inside wall is the accepted line. A very wide, power-on exit launches you down the hill past the “old” pits toward Eau Rouge. I tried going high left into La Source, keeping the revs up and riding the outer side of the turn. Over the outside curbs and onto the faux grass (a green plastic mat), which has a surprising amount of traction. The steep hills of this track coupled with the very high average speed makes it a real challenge. It’s one of the best tracks I’ve ever driven, but would put off someone without a lot of track experience. Although I have no doubt that driving an F1 car here is fearsome, and even more fearsome if raining as it almost always does. 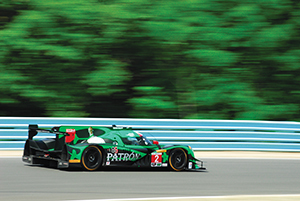 In our 200hp track cars, we just flew around here having a cubic, flat-out fast good time. The food was great, we never saw rain, and the sun/warmth gods shone on us most of the day. Leaving the paddock, there was an open car transporter with 8 or so winged VW Fun Cup cars on it. Neat tube-framed, mid-engined old-style “Beetles” that tour Europe and even have a 25 hour race at Spa. Cool stuff. For more information on RSR track days at Spa and the Nurburgring go to www.rsrnurburg.com. Be sure to watch hot laps from Spa and the ‘Ring on YouTube.